I think his coming out story is relatable for a lot of us. I came out in my late 20’s. It took time and work for me to accept myself. I too am envious of those who were able to accept themselves at an early age and find the courage to live their truth but I know first hand that for many of us it wasn’t that way. Yes, agree his coming out is relatable I too came out late in life. He speaks of wanting to make it easier for the next person in his position. So maybe more LGBT people will be more involved in public office? This was the best interview yet I’ve seen of Buttigieg. He’s so honest and authentic you can’t help but fall for him after listening to him for a few minutes. But what Rachel was able to do as a lesbian was dig into areas of personal identity that have never been questioned before of a political candidate, let alone one running for national office on a TV show televised all over the world. It was brilliant, raw, awkward, and touching. There is no right or wrong way to come out…we all know it is a very personal journey that we each must make in our own way. And Maddow’s interview very cleverly exposed the world to both her and Mayor Pete’s coming out journeys in a way unlike I have ever witnessed. I agree 100%. Definitely Pete’s best interview thus far! I came out very late in life at age 56. Like Mayor Pete, it took me a long time to accept myself…only 20+ years longer than him! It matters not when we come out. It is a very personal journey. I celebrate my sexuality with my soul mate, my best friend, my husband almost every day. I’ve never been happier!! Run Pete, Run!!! America needs you!! I thought it was his best interview as yet. I only wish that Rachael or Pete would have emphasized more that we are all different and so there are many different experiences and degrees of pain surrounding coming out. It’s no big deal to some and to others it can lead to suicidal thoughts. We are not all alike. And that’s not a bad thing. 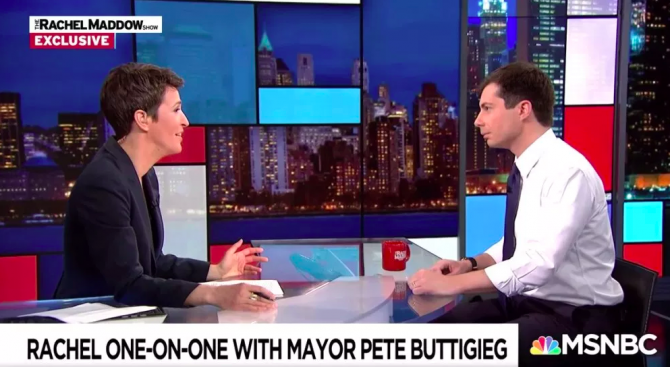 Buttigieg is enormously likeable and he does a very good job of finessing an answer to Maddow’s question. But whatever the difficulties of being out in the military or when running to elected office, I can’t help having somewhat less respect for those who’ve opted to stay closeted for the sake of personal advancement, while leaving the heavy lifting to others. But at least he seems ready to make up for that now. ..the only thing I think of when Mr. Buttigieg talks about coming out is the gargantuan amount of gay men still in the closet, and due to the fear of being identified must join in the condemnation of homosexuality!….as long as they can merge in with their hetero counter parts–they’re safe???? As a Brit who cares what I think. I came out at the age of 16 in the 70’s and every imaginable career was shut down to me. I think it’s cool Pete is standing, but I’d like to see his being gay as incidental. I’d love to see the focus on his political manifesto. I thought Rachel was a bit stiff with him for some reason. She was leaning back from him during the interview and she usually reads a little warmer.